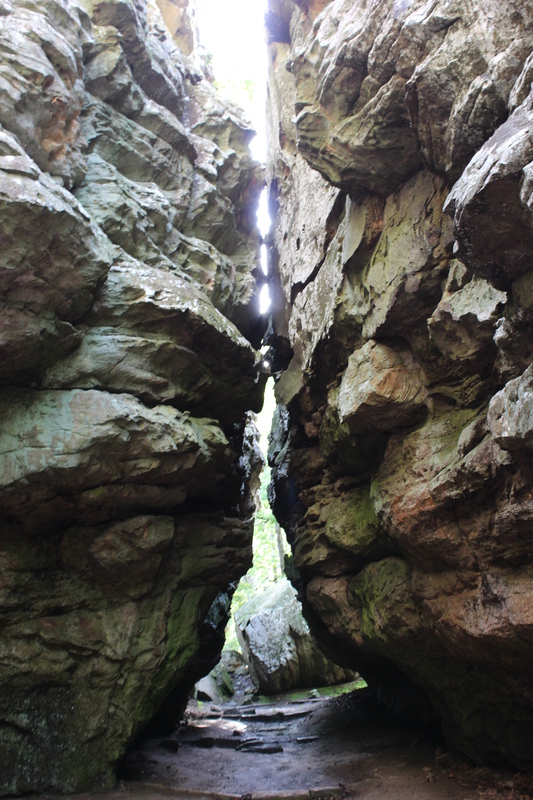 The very first posts on this blog happened to be about Petit Jean State Park. Interestingly enough, they weren’t even about RVing. 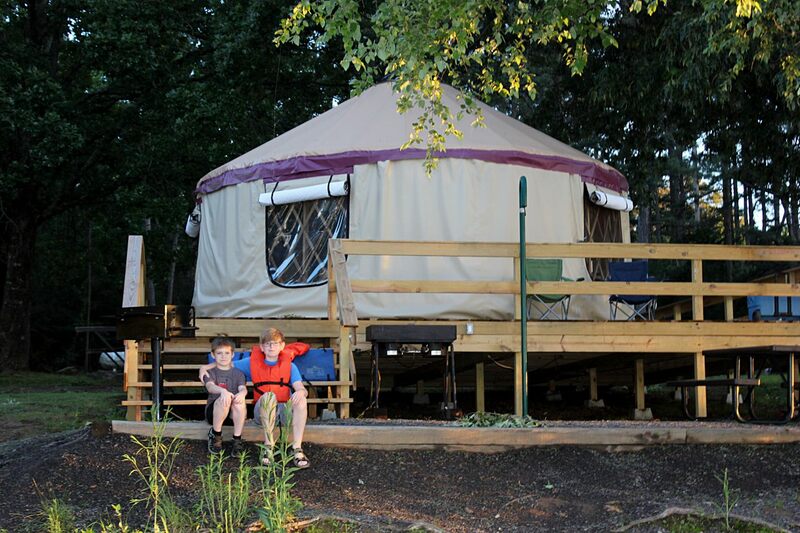 A month before we bought Birdy, we took a trip to Petit Jean to stay in a yurt (yes, you read that right, a yurt). We weren’t sure what we were getting ourselves into, but we ended up loving it. We definitely wanted to buy a camper and take more adventures. We definitely needed to make a return visit to Petit Jean. It took us just over a month to check item #1 off our list, but it took us over three years to take care of #2. (If you’d like to read about our first trip, check out these posts: Pretty Petit Jean and The Time we Stayed in a Yurt in Arkansas). Once we finally made it back to Petit Jean, we were pleased to find it was as beautiful as we remembered, and this time, we were hauling our own little travel trailer. While the fall colors were not as brilliant as we had hoped, Petit Jean still knocked us off our feet. The name of the park is related to an evocative tale. As explorers were setting off to journey across the Louisiana Purchase in the 1700s, a young French woman implored her lover to marry her, so she could go along instead of being left alone to pine away in his absence. He refused due to the dangers of such a journey. Petit Jean eventually travelled all the way from France to what would later become Arkansas. The dangers of the journey that her lover had so worried about ultimately did Petit Jean in, and she became terribly ill and her true identity was revealed. 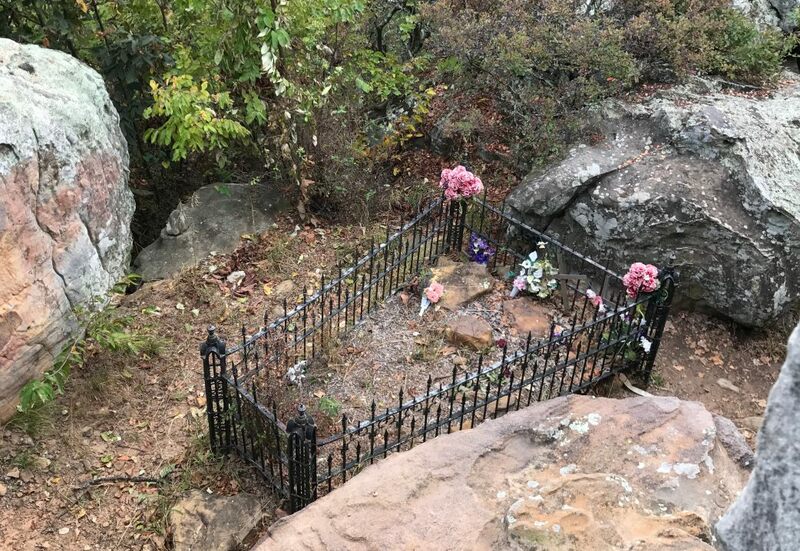 On her deathbed, she asked her lover to bury her atop Petit Jean Mountain at a spot overlooking the Arkansas River Valley. He obliged. To this day, Petit Jean’s grave can be found at this scenic spot. Whether her body is actually there, no one knows. Truth be told, I’m not sure anyone knows whether Petit Jean ever really existed. However, that’s what makes legends so intriguing. 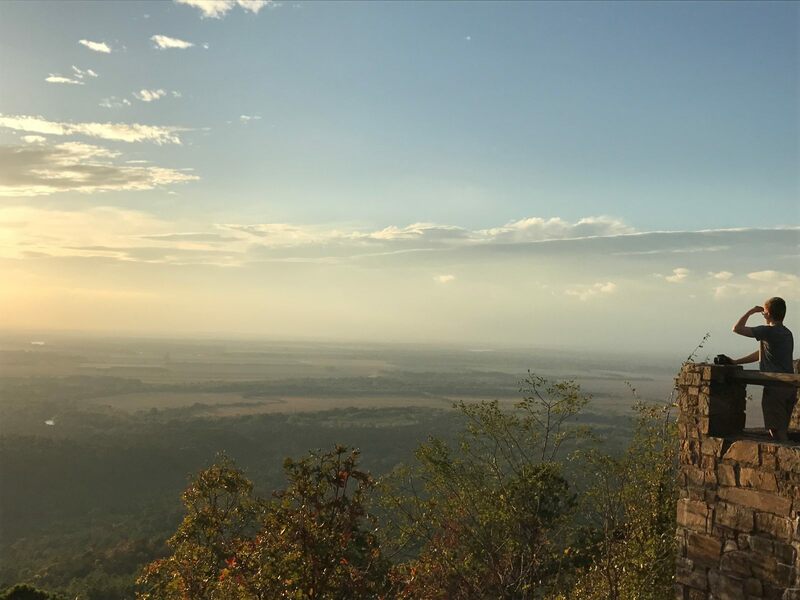 We don’t need to know the truth to let our souls be stirred by the thought of someone wanting to spend eternity at the top of Petit Jean Mountain. Once you visit, you might feel the same way. 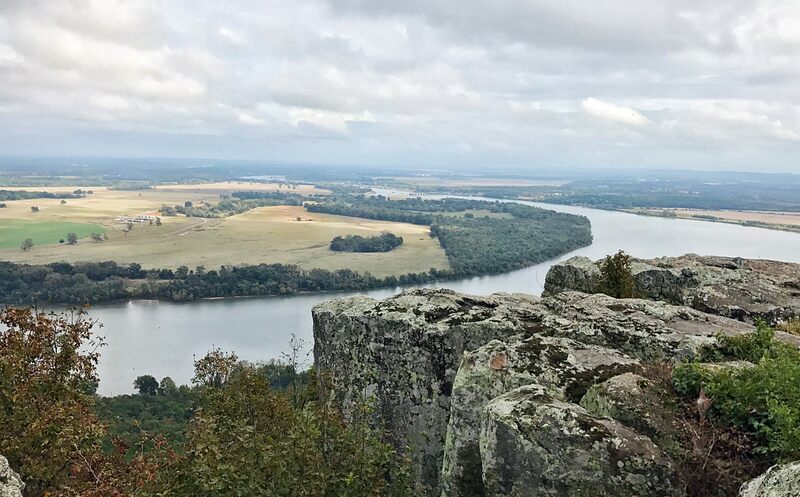 Petit Jean Mountain rises over 1000 feet above the Arkansas River Valley. The many scenic viewpoints allow you to look over the wide swath of the valley’s flatlands, the twists and turns of the river, and the rolling hillside. 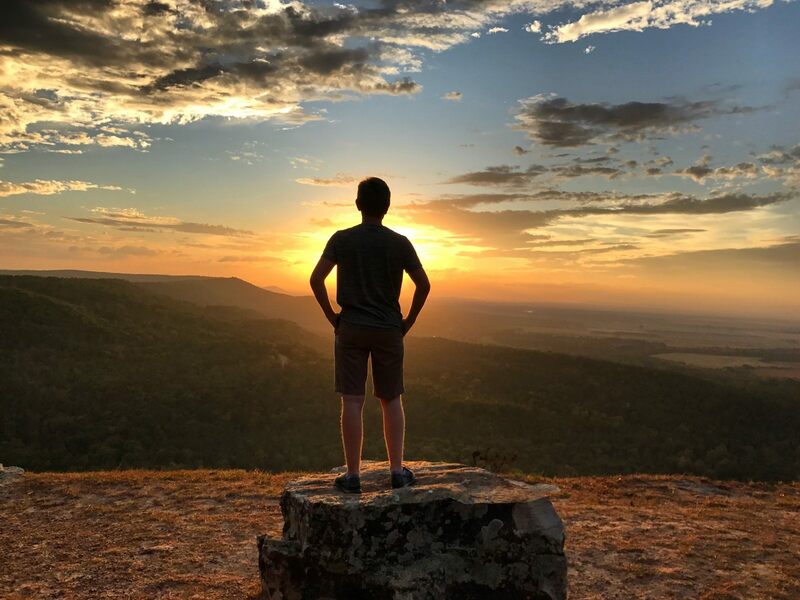 The height of Arkansas’s mountains can’t compare to the grandeur of bigger mountains, and yet, there’s something quite magical about Petit Jean. Petit Jean State Park is located an hour northwest of Arkansas’s state capital, Little Rock, in the north-central region of the state. The campground is considered one of the state’s best, and visitors can also choose from many other types of accommodations, including the lodge, cabins, tent sites, and yurts, as I mentioned above (more on this in my next post). 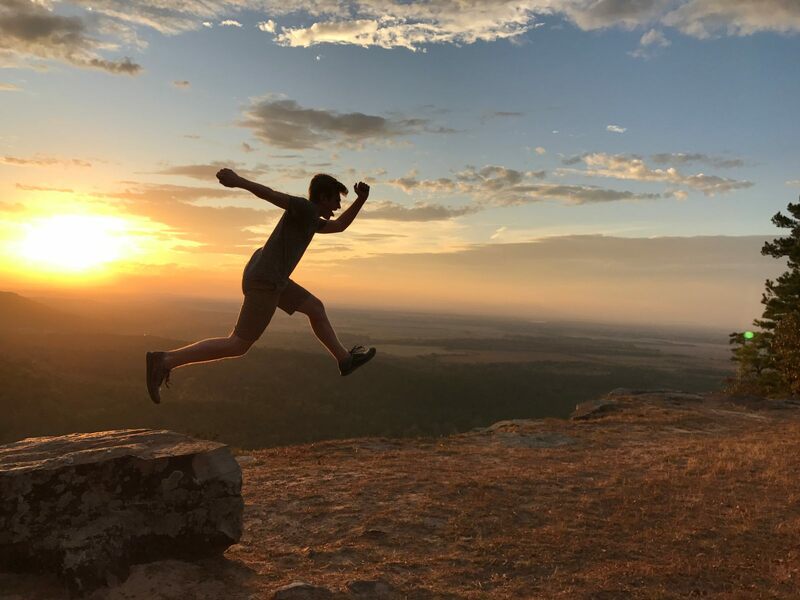 In prior centuries, the plateau at the top of Petit Jean Mountain was home to Native Americans, small farming communities, and a YMCA camp before becoming Arkansas’s first state park in 1923. In addition to the epic views, the park is home to an epic waterfall, Cedar Falls. 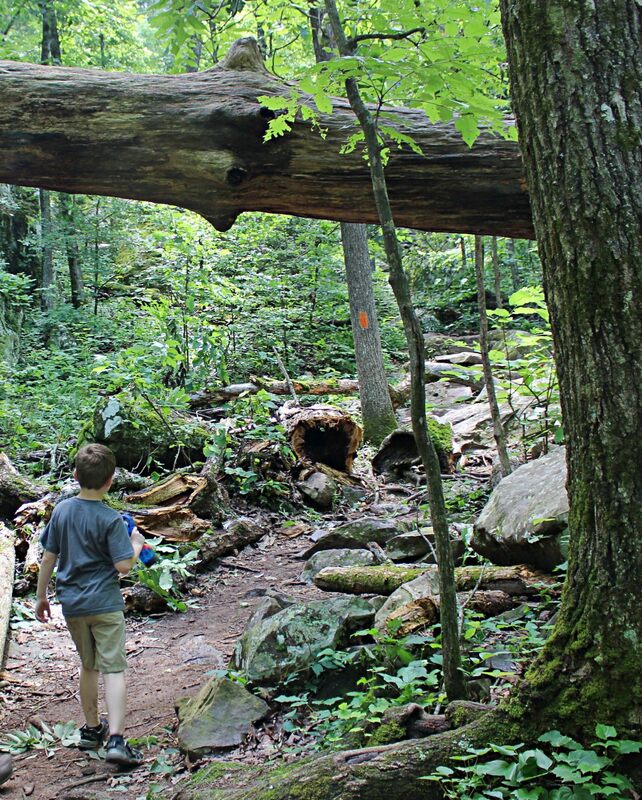 Over time, a number of trails were built in the park, providing visitors plenty to explore. In the 1930s, the Civilian Conservation Corp (CCC) helped develop the park’s infrastructure and built the iconic Mather Lodge and several stone and wood buildings at scenic overlooks. With all of this interesting history, it’s no wonder the park is home to three National Historic Districts. Today’s visitors will find much to explore. Hike or bike the many trails. Try your hand at catching a fish. Hop into the park pool. Relax and take in the views from Mather Lodge. 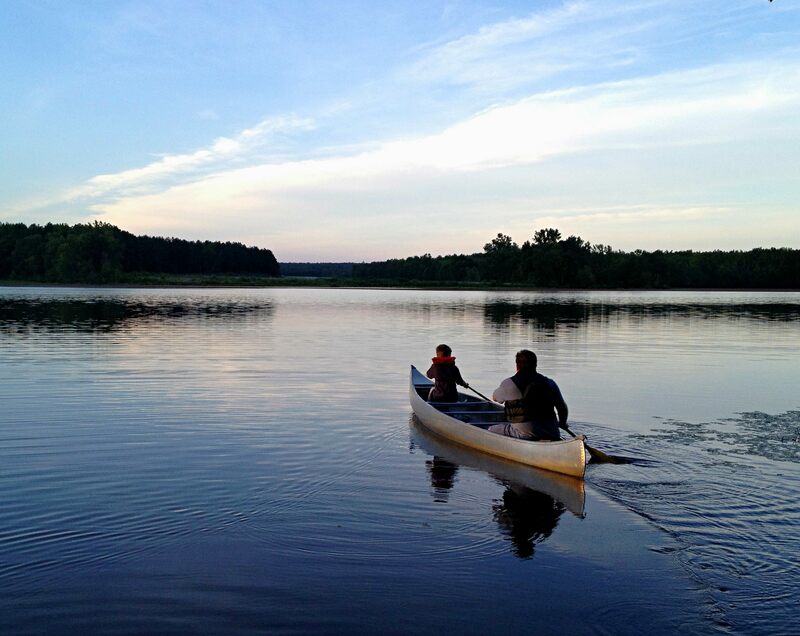 Paddleboard or kayak the waters of Lake Bailey. 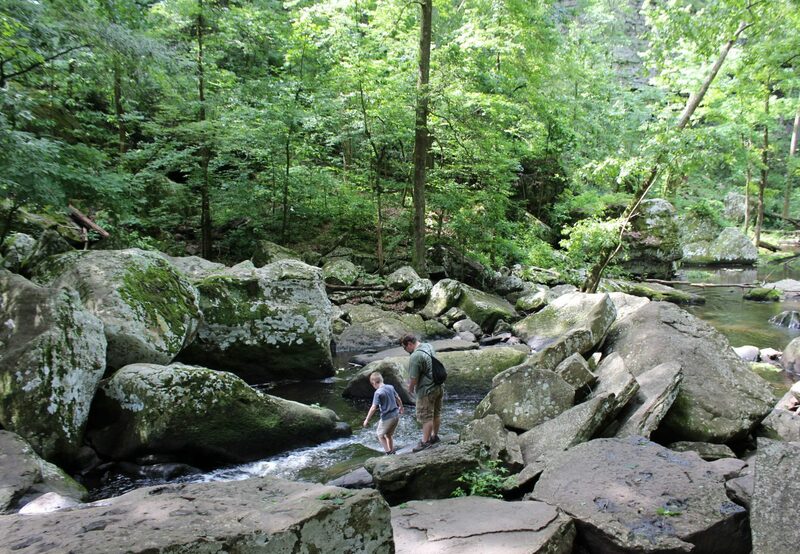 Visitors will find 8 trails of varying lengths and levels of difficulties traversing the natural landscapes of Petit Jean. The two shortest are merely .25 miles long, while the longest extends for 12 miles through rugged terrain. We did three of these trails on our first visit and one on our most recent. 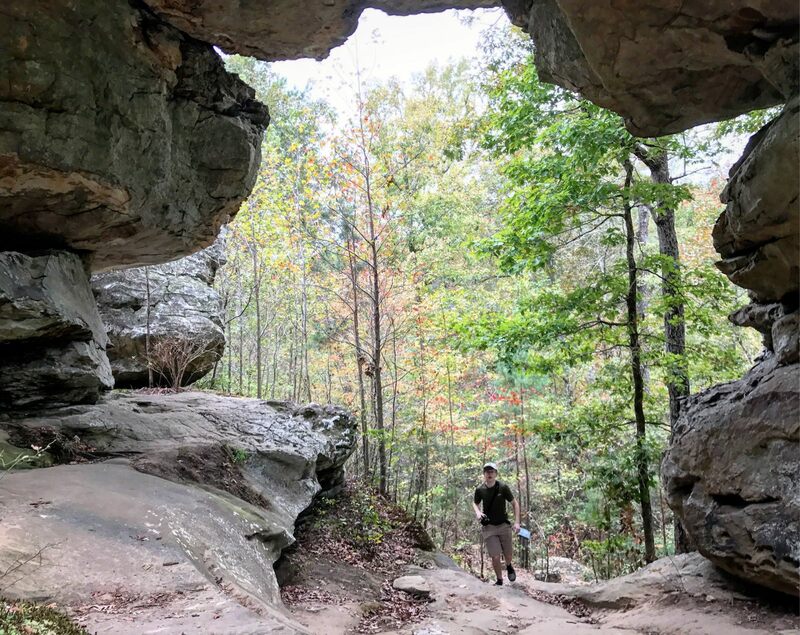 The shortest trails are Rock House Cave Trail and Bear Cave Trail. These take you to some of the unique rock formations found in the park, as well as evidence of earlier inhabitants (Native American petroglyphs have been preserved in the Rock House Cave). Visitors of all ages and physical levels should be able to complete these. 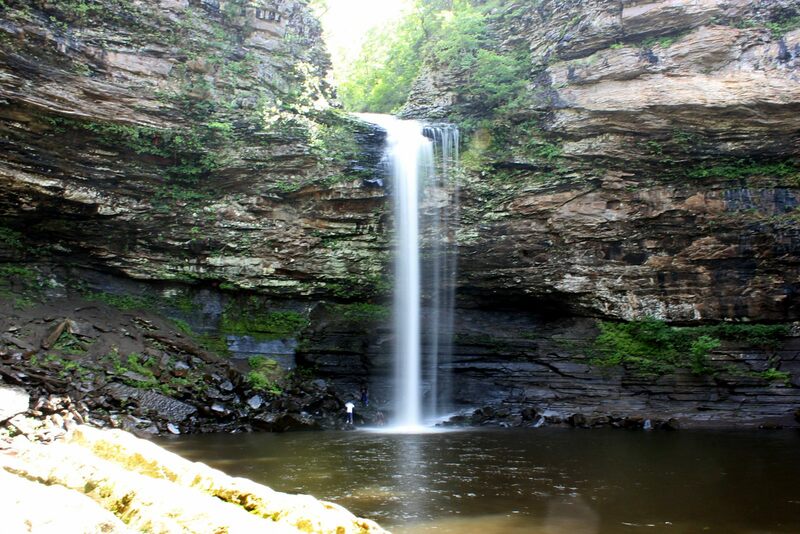 Perhaps the most famous trail at Petit Jean is the Cedar Falls Trail. While only 2 miles long, this is one of the most strenuous trails because you hike down a mile into a canyon and then must hike uphill for a mile back out of the canyon. Aside from the elevation gain, this trail involves navigating lots of steps and rocky scrambles. Luckily, the stunning scenery takes your mind off of the huffing and puffing you’ll be doing. Part of the trail follows Cedar Creek through a lush woodland valley. The payoff for hiking Cedar Falls Trail is the impressive waterfall. Cedar Falls is a cascading 95-foot drop, created when Cedar Creek plunges over the rocky bluffs that interrupt its path. (In the photo below, look for the man with the white shirt to understand the scope of the falls.) 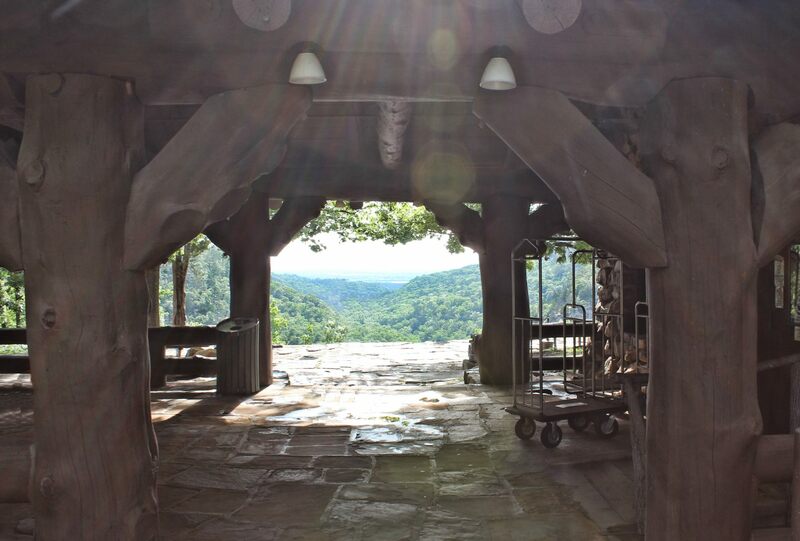 Be sure to also visit the Cedar Falls Overlook for impressive views of the waterfall from above. 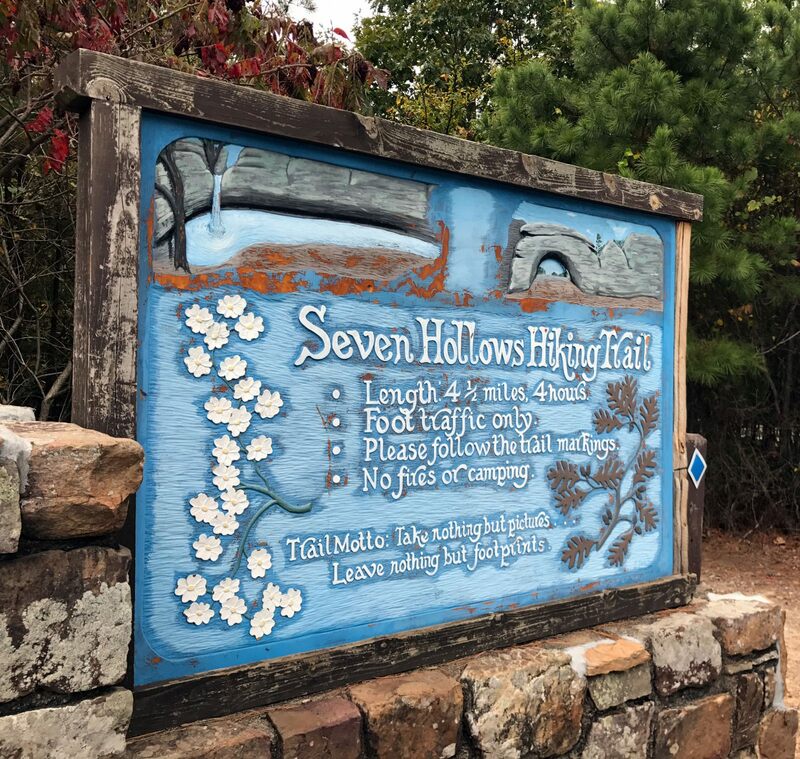 On our most recent trip, we decided to tackle the 4.5 mile 7 Hollows Trail. 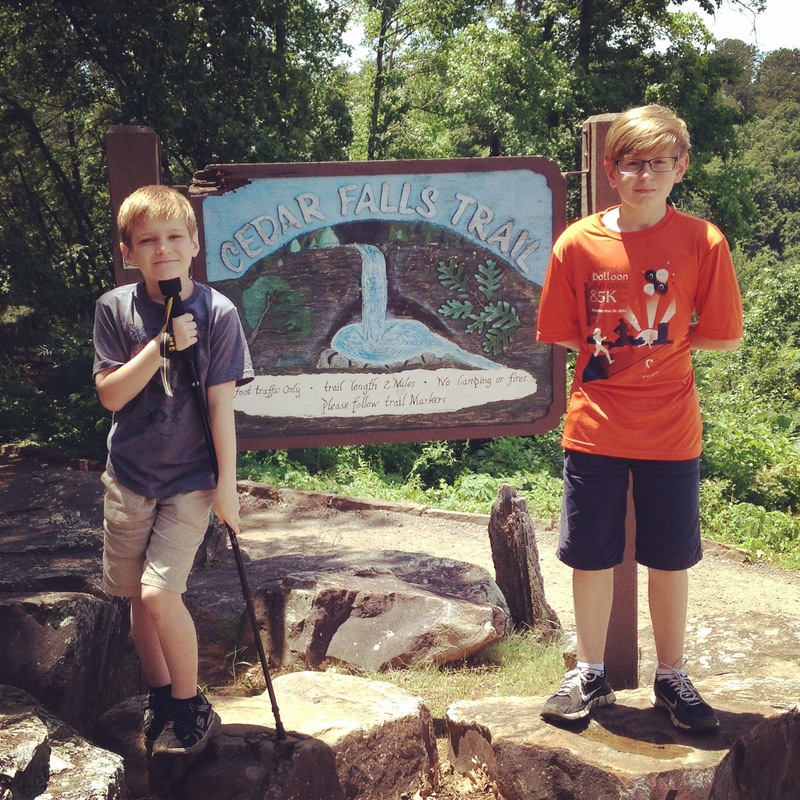 (Actually, *I* decided to hike the trail, and my husband and teenage son protested). Even though the guidebook warned that this was a moderate to strenuous trail, I underestimated how difficult it would be. Like the Cedar Falls Trail, this one changes in elevation a lot and involves scrambling over rocky sections. Pretty soon, I was the one doing some whining, and my husband and son were saying, “We told you so.” Once we were done, however, I was quite proud of our accomplishment. Our hike along 7 Hollows Trail was very slow going in some parts, but we enjoyed the diverse landscapes. We visited in late October, just as the autumn leaves were beginning to peep out, providing vibrant splashes of color in the woodlands. The natural bridge was my favorite spot. This massive rock formation seems to rise out of nowhere. If you don’t want to do the whole trail, you can hike 1.3 miles out to this part and then turn around. It’s always good to be awed by something that reminds you of how small you are. No matter which trail you pick, you absolutely must take the time to do one or more. 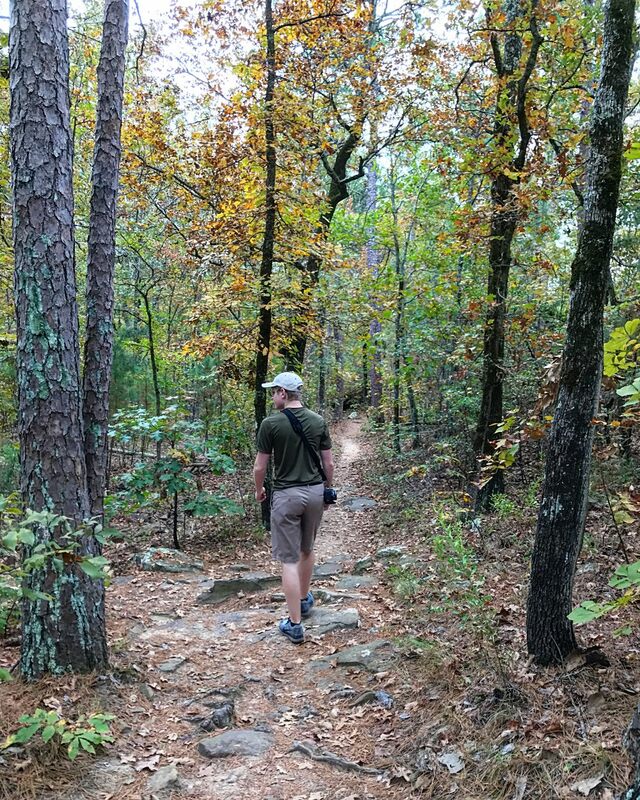 As John Muir said, “Of all the paths you take in life, make sure a few of them are dirt.” Petit Jean provides plenty of dirt trails through lovely landscapes. More than anything else, my favorite part of Petit Jean State Park is the many scenic overlooks. Since the park sits atop a mountain, it is no surprise that there are many spots offering expansive views. To find Petit Jean’s supposed grave, you’ll have to go four miles east of the park. Though it’s a bit of a drive, this scenic overlook found here gives you the best views of the Arkansas River Valley. Centrally located in the park, Red Bluff Drive takes visitors to the Richter Memorial Overlook and the CCC Overlook. Sunset is the best time to hit these points, as the warm glow lights up the hills and valleys below. 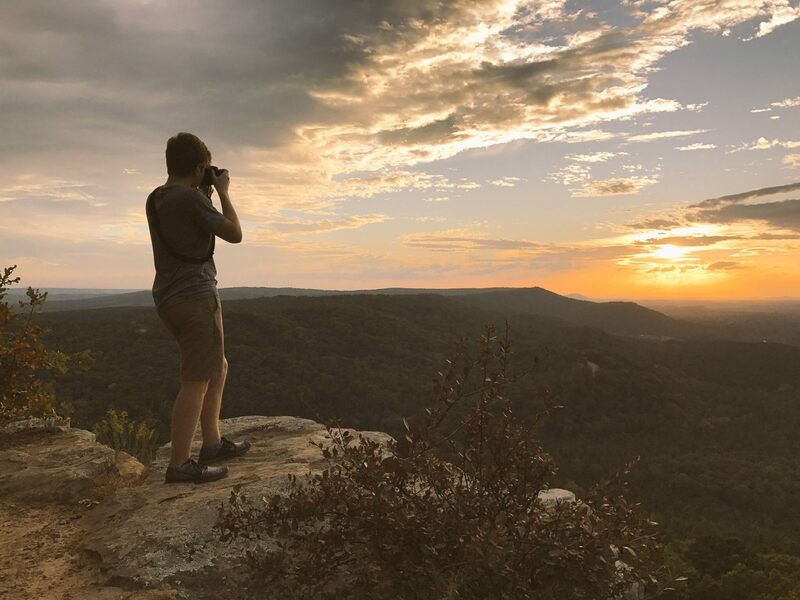 At the CCC Overlook, we found the glowing orb perfectly placed beyond the bluff, providing a fun spot for playful photography. The morning of this trip, we had made the agonizing decision to let our younger son stay home. After we planned the trip, he found out a really important social event was taking place the same weekend (aren’t all social events really important for 7th graders?) We really wanted to enjoy some down time as a family and planned to make him go along despite his protests, but ultimately, we decided to allow him to stay home with his grandparents. He was happy; they were happy. And the upside for us? More quiet time with our older son. He’s on the cusp of turning 16, so our years with him at home will pass in a blink. I can’t complain about having some quality time together for a weekend in an amazing spot like Petit Jean. I will cherish these memories. With so much natural beauty, it’s easy to overlook the manmade elements of the park, but Petit Jean also has many historic structures to explore. The most striking is Mather Lodge, which forms the heart of the park. 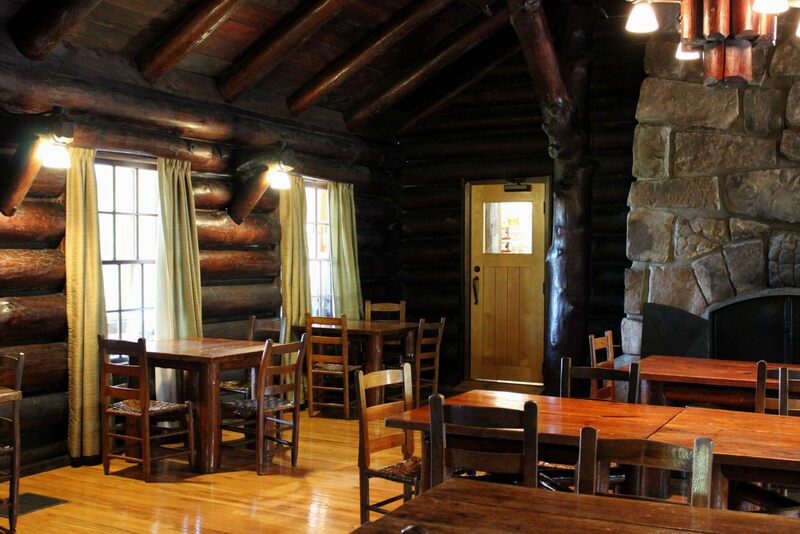 Built by the CCC, the lodge is a treasure of wood and stone. Rooms can be rented in Mather Lodge, or you can stop by to enjoy a meal in the restaurant and or to pick up unique items at the gift shop. Out back, you’ll find a patio overlooking the rolling hillside. Similar architecture can be found across the park. Be sure to also look for the CCC statue built in honor of the young men who provided the labor for these magnificent structures in the 1930s. For an even older structure, check out the Pioneer Cabin. Built in 1845, this one-room cabin was once home to a family with 9 children. Look at the worn plank floors and hand-built stone fireplace and just imagine what life was like for them. Petit Jean State Park is a magical place. We’ve spent two weekends there and have yet to see it all. The mixture of natural beauty, history, and recreational opportunities make this one of the nation’s best state parks. We’ve visited a dozen or so national parks, and Petit Jean rivals several of the smaller ones, in my opinion. 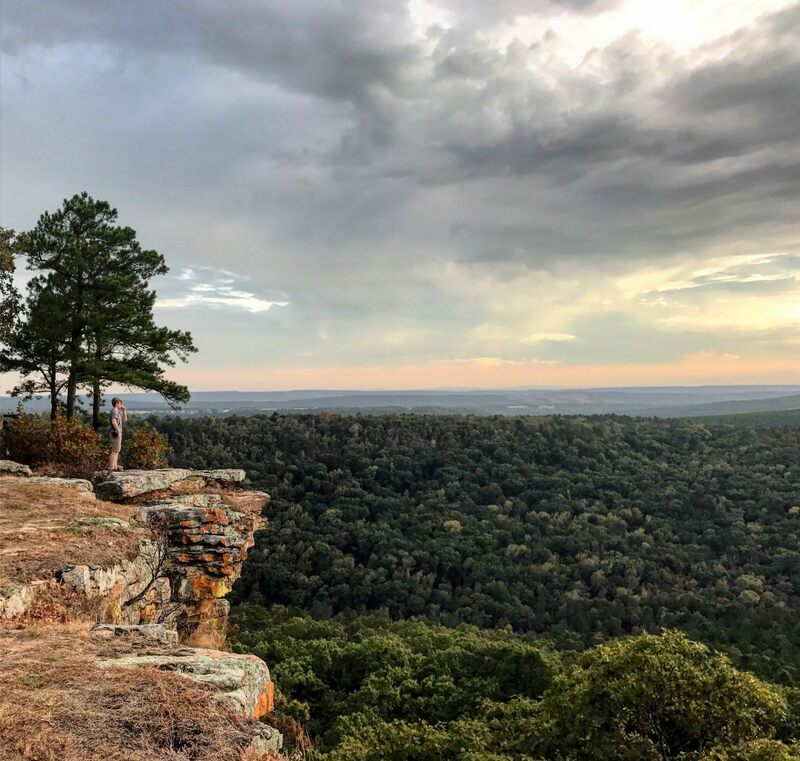 I truly believe Arkansas is one of the most overlooked travel gems, and Petit Jean State Park encapsulates all that the Natural State offers. Petit Jean does not have developed towns close by. Be sure to pick up any necessities before you arrive, and don’t plan to hit restaurants outside of the park without a long drive. Russellville and Morrilton are the closest towns, and they are 30-40 minutes away. I highly recommend staying in the park (review coming soon). Once you arrive, be sure to pick up a park map. There’s so much to see and do, you are unlikely to find it all by meandering around the park. If you plan to hike, the trails map is also super useful. These brochures and more are all available on the park website. 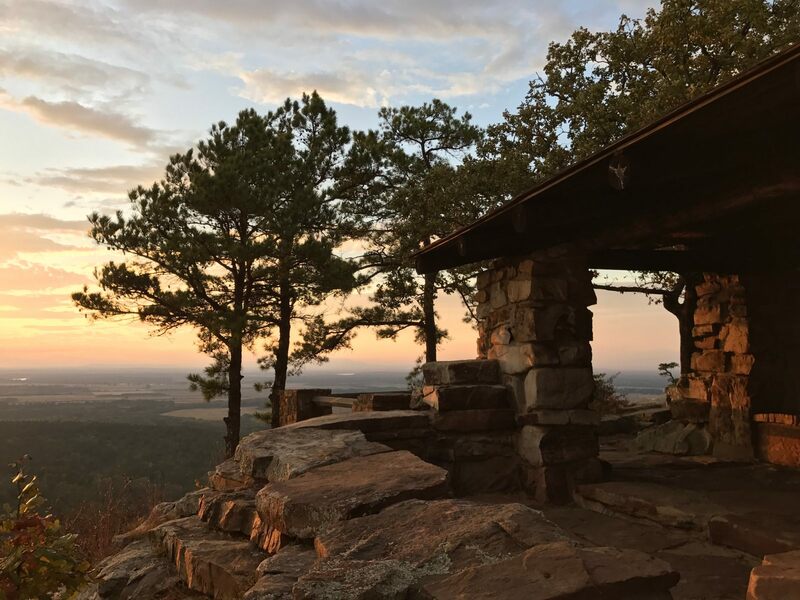 Mount Magazine, Arkansas’s highest point, is just over an hour west of Petit Jean and would make for a great day trip from the park. Mount Nebo State Park is also nearby. Posted in: Places We've Explored. Tags: Arkansas, Hiking, State parks. You should definitely come to Arkansas, and we could have a nerd boy powwow! The NW region is especially beautiful. It may be similar to TN, I would guess. Petit Jean has beautiful signs like that everywhere. They are so grand and lovely! How far a part are the RV campsites from each other? I’d say the campsites are generously spaced. The ones by the lake are especially large. In the circle loops, the ones on the outer rings are larger than the ones on the interior. Even in the areas where the campers are lined up beside each other, they have a good distance. Did you see my other post about the campground itself? It has quite a few pictures. If not, you can find it here.